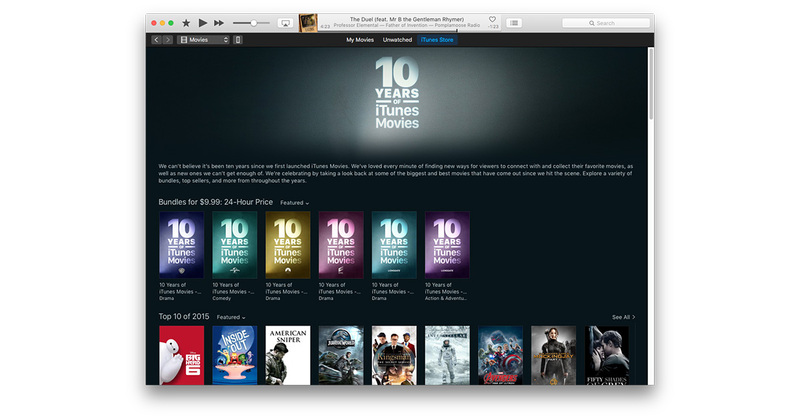 Apple is offering 10-movie bundles for US$10 to celebrate ten years of movie sales on the iTunes Store. The collections include movies such as “Pacific Rim,” “Superman Returns,” “Knocked Up,” “The Wolf of Wallstreet,” “No Country for Old Men,” and “The Queen.”Apple is also highlighting the top the iTunes movies (sorry, no deals there) over the past decade with—no surprise—loads of Pixar titles. The bundles are great deals, so be sure to check them out today before they’re gone because this is a 24-hour sale. My appeal to Apple… I was recently given a credit for an issue I had with iTunes but I’d like to have someone else review this situation maybe a supervisor (or anyone who cares?) As much as the 3 free movie rentals is a nice offer it doesn’t begin to address the real issue which is the fact that it is nowhere near the same as owning 60 movies for $60.00! It is fair to say that I am not much of a fan of iTunes, in my opinion it has always been the weakest link in Apple’s ecosystem, and honestly I haven’t spent a lot of money on iTunes either as it’s rarely my first choice in media consumption as there are many, many other choices that are simpler, more reliable (read less buggy), and cheaper. With that said I felt that this promotion would be worth exploring and actually give me some choices when it comes to entertainment. It might even convince me that iTunes isn’t as bad as I remember it to be. Who knows maybe it had gotten better since the early days of syncing my iPhone which would take forever over the cable and would be both complicated and frustrating when it wouldn’t work correctly, after all that was a long time ago and a different side of what iTunes has to offer. Maybe it was time for a second chance who knows maybe it would be a way to convert me, show me how simple things could be to have media at my fingertips and maybe even create a habit I could get use to. At the time I was online ordering, it showed the promo price of $9.99 for a 10 movie bundle with a total of 6 bundles so I filled my cart and went to checkout. What I got was an error message and it wouldn’t let me complete my order and when I finally was able to get things to start working properly again the price had been hiked up drastically. Now I’d like to point out that every single trusted blog and news source (dozens and dozens of them) showed the expiration time as 11:59 pm pacific time – I do understand that Apple does not write these blogs and news stories directly and can’t be held directly responsible for what they say but they must get their information from somewhere, and with that many credible publications reporting one would assume the source would be Apple itself. It was not after midnight in Cupertino when every other promotion would normally expire, nor was it even midnight here in Denver where I live and was making the purchase from. Which leaves me to believe that you either pulled the promo early, changed the expiration time from the precedent you set with previous promotions, and/or did not make it abundantly clear when the expiration time really was for this promotion, causing me and many, many others from finishing our purchases. But I digress in that it doesn’t matter all the specific Apple products I use but that everywhere I look, and everywhere I reach, I am reminded of Apple and the amazing products that “just work”. So the question isn’t whether you need or even want my $60 because in all honesty you don’t. You’ve got enough money to buy the entire Disney company with your cash reserves alone. But what you should be asking yourself is “What am I thinking now? Do I still see it all the same? Or every time I see an Apple product – which is all the time as I am surrounded by them and one is never out of reach given the fact that my Apple Watch is on my wrist (no not that Apple Watch it’s actually a Mac OS Apple Watch from the 90’s that has a retro design reminiscent of the Memphis Milano designs from the 80’s) – am I reminded that they are just a greedy company that doesn’t care about the little guy and refuses to honor their own agreements or at the very least make good on their mistakes? Does it just solidify my distaste of iTunes? And if you were really smart you’d ask yourself if this would be an opportunity to double down on an Apple enthusiast, someone who already believes in the Apple ecosystem with friends and family that he’s introduced to Apple, and is this an opportunity to change his mind about iTunes, to show him that it’s not a chink in the armor but actually the oil in the machine. The choice is yours apple as the ball is in your court. I can’t even take my ball and go home because it’s your ball. Is there another link? I clicked on the link in the article and there are Zero Pixar movies in the sales bundles (which are grouped by studio & there’s no Disney or Pixar bundle ). Also there are only 8 Pixar movies out 100 movies listed for the top 10 of the last 10 years. But for some reason no Young Frankenstein.